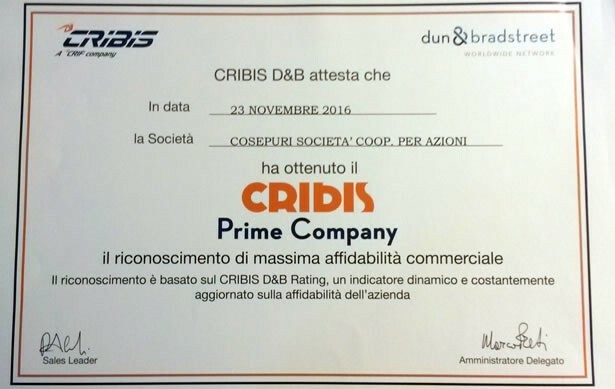 This year, Cribis D&B (born from the strategic alliance between CRIF, a global group leader in credit information systems and decision support, and D&B, the world leader in the field of business information) has awarded COSEPURI with the "CRIBIS Prime Company" certificate, which recognizes to Italian firms the "rating 1", the maximum degree of assessment of an organization. This prestigious award, granted only to companies that maintain stably high economic and commercial reliability, today is obtained only by 3% of the more than 6 million Italian companies. This milestone is a further confirmation of the soundness of our cooperative level, that not only has demonstrated good resilience in the difficult years that have long marked the economic landscape, but has also made this step forward, achieving the highest level of assessment assigned only to firms which meet the parameters of both Italian and foreign "economic-commercial goodness".